Want to get involved with our program and impact the lives of thousands of outstanding young women across the country? There are lots of ways to support our program whether it is volunteering your time at the local, state or national levels or through a donation to support our program. Distinguished Young Women is proud to have the support of over 10,000 volunteers throughout the country. These individuals are the heart and soul of our program, and the ones who “make it happen.” All levels of our program are always on the hunt for volunteers looking to give of their time and talents. If you would like to get involved, visit your state’s website and get in touch with their chairman. Distinguished Young Women is a non-profit organization supported by donations from individuals, corporations and foundations. Through these contributions, we are able to provide high school girls with college scholarship opportunities and a unique experience that promotes excellence in the areas of scholarship, leadership and talent. Distinguished Young Women is a 501(c)-3 organization. All donations are tax-deductible. Thank you for your generosity! 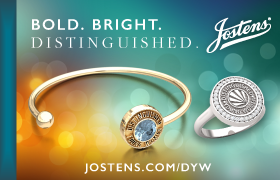 Did you know that when you purchase items on Amazon.com you can support Distinguished Young Women? When customers shop on line at smile.amazon.com, the AmazonSmile Foundation will donate 0.5% of the purchase price from your eligible purchases to us – at no cost to you! You’ll find the same low prices and selection as Amazon.com, with the added bonus that a portion of what you spend will go to Distinguished Young Women. Click the button below to proceed to Amazon Smile.